They say that beauty is in the eye of the beholder, but what they don’t tell you is so is form and function. It can be a challenge for any REMODELING or DESIGN professional when you take on a new client, go look at the room to be redone and think it’s beautiful! “Why would you want to change this?” we sometimes think to ourselves. What we have to keep in mind is that it doesn’t matter what we think of it, or if it would work for our lifestyle. What is important is that it doesn’t work for our client! Take for example this Cobb County KITCHEN. Despite a dated stain on the cabinetry, it could have been the ideal KITCHEN for a young couple, even empty-nesters, but it did not work for this family with three young children who lived there. Though the kitchen had new STAINLESS APPLIANCES, solid surface COUNTERTOPS and a tumbled STONE BACKSPLASH the client’s wished for a more uniform use of high-end materials throughout the space. They had more of a unique DESIGNER look in mind, instead of a production builder style layout. They also absolutely had to have more seating! As the professionals in this situation, we now had a creative challenge. The clients wanted to add more storage, more countertop space and more seating all in the existing space. Our team confronted this challenge by removing a useless wing wall to create a longer, continuous wall of cabinetry. 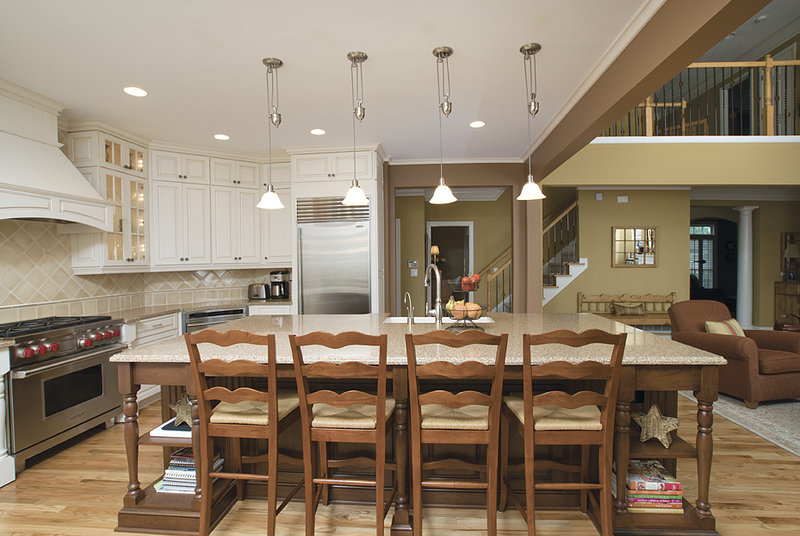 The L-shaped Island was removed to make room for a larger more functional island in the center of the room. A pantry which also served as a support structure was completely removed. LVL beans had to be installed to adequately support the second floor of the home. The removal of the boxy feature really opened up the space and improved the traffic flow from the hall, through the kitchen to the family room. Finally, a window seat was designed out of the perimeter CABINETRY to maximize the full potential for seating in the existing space. A table pushed up to the new window seat gave the client’s the extra seating they wanted. Spice pullouts, rollout drawers, and a pantry pullout give the redesigned kitchen the ultimate in function and storage. The new flow of the KITCHEN and the open feel of the space was an astounding change for the clients. The new large ISLAND boasted seating for four and served as the children’s homework central. Books, binders, pens and pencils could all be stored in the shelving alongside the chairs. The very large, single level countertop allowed for more than one chef to work in the KITCHEN at a time. This design decision was very important and very personal for these clients as cooking with the kids was a special family tradition. A challenge? Yes. Impossible? No. It is always a pleasant surprise, even for those of us in the industry, what some literal “outside the box” thinking can do. It always leads to the most fabulous transformations and the most popular!